Lay the sweet potatoes out in a single layer on a roasting tray. Drizzle the oil, salt and pepper over the potatoes. Roast for 25 to 30 minutes in oven or until tender. In a saucepan add honey, balsamic marmalade and ginger. Stir to combine. 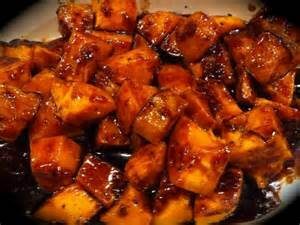 When potatoes are roasted, remove and toss to coat with marmalade mixture. Post script… this marmalade will be available at the market if you want to try some for yourself. Going to try it on a pork roast next!